The Kamio rebels are at it again. Awhile back, Frausto-Tek Industries declared war against me, only to be stunned when I defeated them within minutes by inflicting a kill-to-death ratio of 31.25:1. After nursing their wounds, Frausto-Tek returned to war, launching a wardec against Bing Bangboom, an Agent of the New Order who frequently patrols Kamio. 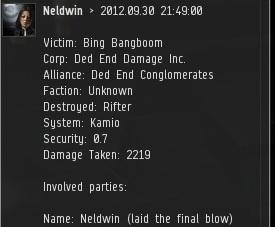 Neldwin, a member of Frausto-Tek, succeeded (with some help) in killing Agent Bing's Rifter and podding him. Neldwin was giddy with excitement as she shared the killmail of the frigate. A few other rebels who were at their keyboards celebrated the news of the dead Rifter. But then Angel Violette challenged Neldwin to a 1v1 duel. 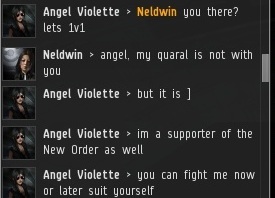 Angel wasn't a member of Bing's corp, but a "quaral" with one Agent is a quarrel with the entire established Order of highsec. The prospect of fighting Angel must have been intimidating. But fresh off the ecstasy of the Rifter kill, Neldwin was feeling invincible. 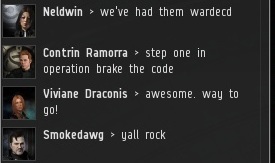 They agreed to flip cans in order to keep Concord out of the fight. 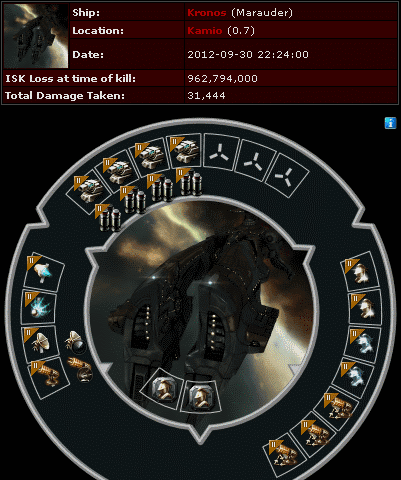 Each side brought a tech III ship: Angel flew a Loki, and Neldwin flew a Proteus. 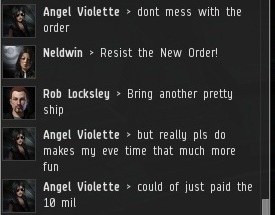 Neldwin wanted a rematch, and brought her Kronos, a marauder. One of Neldwin's corpmates, Contrin Ramorra, also wanted to get in on the action. He crashed the "1v1" by ambushing Angel with his Apocalypse. It was a crushing defeat for the Frausto-Tek crew. As befits an Agent of the New Order, Angel showed compassion to her fallen enemies. She reasoned with them. Frausto-Tek could have spent merely 10 million isk per pilot to purchase mining permits. Instead, they lost a bunch of expensive ships. But Neldwin wasn't having it. Bing returned to Kamio in a freshly-minted clone. Rather than taunting the miners about his vengeance, he ran the numbers: Ten million per 365 days works out to precious little isk. The New Order mining fees are very affordable, so why the resistance? Frausto-Tek suffered about 1.8 billion isk in damages. Suddenly the Rifter kill didn't seem like such a big deal. Agent Bing hopped back into his Stabber and resumed bumping. The Kamio community engaged in an intense discussion about the relative merits of joining the New Order. Agents strongly recommended it, while the rebels went on about "losing humanity". You all know how I feel: There's nothing human about bot-aspirant behavior. In my mind, there's no debate about which side represents humanity and which side represents the machines. Another day, another huge victory for the New Order. I would love to say the Frausto-Tek crew came to their senses and joined the New Order, but they continued in their madness. Another time, perhaps. With fits like that he's going to need a lot more friends in his ambush. That Kronos fitting should make loss-of-the-day on someone's blog. No faction web on a web bonus-ed ship. No armor repper on an armor repping ship. Optimal range script? Afterburner? Two hardeners and Two EANM's? No plate? 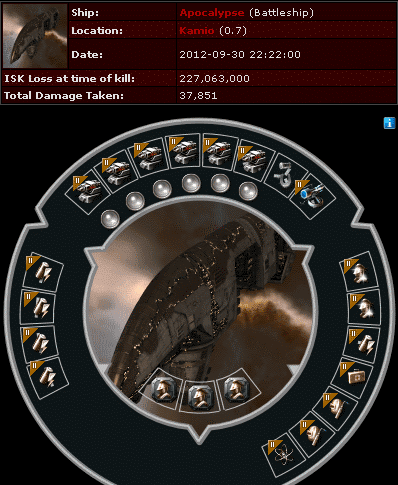 It's a 900m isk ship with 100m isk fittings. 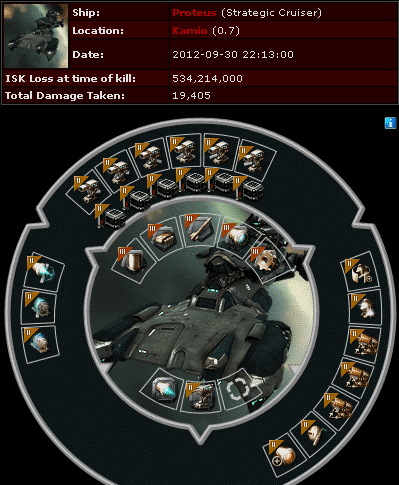 It's like he bought a Marauder and used his battlecruiser loadout. Seriously, even a battleship should have more spent on it's fittings. Just realized it was a tracking speed ship. It's already got insane tracking speed.... Fit different ammo and use your insanely bonus-ed web to track, not a tracking speed mod. Don't forget how BOTH battleships have no points.